Help your colleagues develop their professional careers: have them join the SBE today. The SBE wants your help in recruiting new members, and you can win rewards for your efforts. Sponsor a new Member, Associate Member or Sustaining Member between March 1 and May 31, 2018, and you will be eligible for the prize drawings. For each approved new member application you sponsor you will earn $5 off your 2019 membership dues, up to $25. Each new member application may have only one sponsor. Applications must be received at the SBE National Office between March 1 and May 31, 2018, to be eligible. Drawing for all prizes will be completed by June 26, 2018. 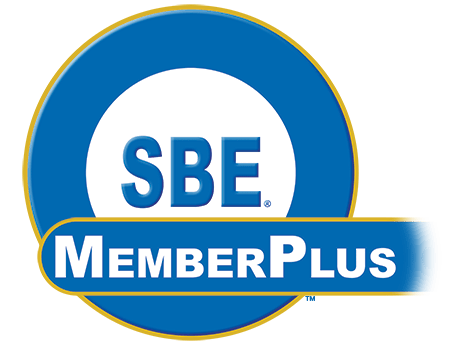 New in 2018: If you recruit three or more Regular or Associate Members, or one Sustaining Member, you will also receive an upgrade to SBE MemberPlus for the remainder of the 2018 membership period. A trip to the SBE National Meeting held in conjunction with the annual Media Resource Expo 2018 in Danvers, MA, Oct. 2-3, 2018. Prize package includes round trip airfare for one from within the continental US to the meeting; all SBE National Meeting and engineering conference events; and two nights at the host hotel. Additional Prizes are donated by SBE Sustaining Members and our bookstore publishers. See the list at sbe.org. This award recognizes a chapter in each size division recruiting the most new members during the Membership Drive. Category A and B are based on chaper enrollment, Class A represents chapers whose membership is less than the national median. Class B includes chapters with a membership greater than the national median. Plaques will be awarded during the SBE National Awards Dinner on Oct.3 in Danvers, MA. Where do I find new members? Prospective members can be non-members attending chapter meetings, fellow engineers at work or other stations, suppliers or educators. How do I get credit for new members? Direct prospective members to the SBE website to join online or provide them with a copy of the membership application and ask him/her to fill in your name on the line “Sponsor’s Name/Who introduced you to SBE.” Once the new member’s membership application has been approved, your name will be placed in the prize drawing, which takes place in June 2018. Official Rules: Only members of the SBE in good standing (national dues paid) are eligible. All applications are subject to approval by the admissions committee per the SBE By-laws. Only sponsorships of new applications for Member, Associate Member and Sustaining Members are eligible for the prize drawings. Each approved application will earn $5 off the recruiter’s 2019 membership dues, up to $25. Each new member application may have only one sponsor. Applications must be received at the SBE National Office between March 1 and May 31, 2018, to be eligible. Drawing for all prizes will be completed by June 26, 2018. Winners will be notified by mail. Grand prize winner may choose $500 cash in lieu of the trip package. There are no other prize substitutions. Winners are responsible for any taxes on prizes. Employees of the SBE and their family members are not eligible to win. Contest void where prohibited. Entrants agree that their name and likeness may be used by the Society of Broadcast Engineers, Inc. for promotional purposes. The Society of Broadcast Engineers will hold the 2018 SBE Leadership Development Course Aug. 7-9, 2018, in Atlanta, GA. This three-day course is an intensive study of successful leadership and management, designed specifically for broadcast engineers. To register for this professional development opportunity, go to sbe.org/ldc. The enrollment fee is $670 for SBE members and $725 for non-members. The course will be held at the Hyatt Place Atlanta Airport South; 1899 Sullivan Rd. ; College Park, GA. A special room rate of $126 per night, plus tax, is available through July 7, 2018. Questions? Contact SBE Education Director Cathy Orosz at corosz@sbe.org.